Not only are the colours beautiful but the fact that they are "formulated without camphor, dibutyl, phthalates, formaldehyed or toluene." Probably thinking, what does that mean? From what I noticed after trying out the nail polishes, there is none of that chemical-like fume that you would normally get in nail polishes. On a serious note, Dibutyl Phthalate (DBP), Formaldehyde, and Toluene are the three ingredients in nail polish you should avoid, the "Toxic Trio" as many like it call it. This is why I love the Crabtree & Evelyn nail polish as they are free from it! For clear close-up swatches, check out my other post here, where I will be updating frequently until all polishes have been swatched. But for now, take a look at my Pinterest page and let me know in the comments below which is your favourite shade. 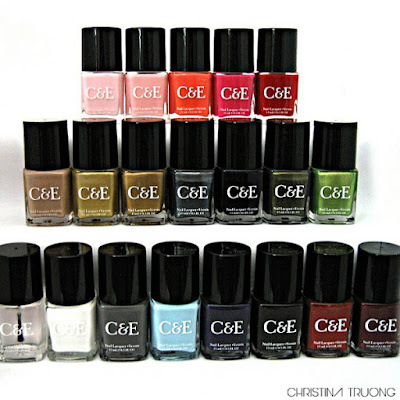 Are you planning on making a Crabtree & Evelyn nail polish purchase? If so, which colour(s)?